Cannibalism and feather pecking are a complex multifactorial behavioural problem of poultry and game birds worldwide. Predisposing factors include tensoynovitis and other diseases affecting mobility, boredom and strain of bird. Cannibalism and feather pecking may lead to skin wounding leaving it open to bacterial infection. In severe cases this will lead to a loss of blood resulting in generalised anaemia. Nettex Anti Pecking Spray is an all round winner when trying to stop birds from feather pecking which can occur for many reasons, from boredom to strain of bird. 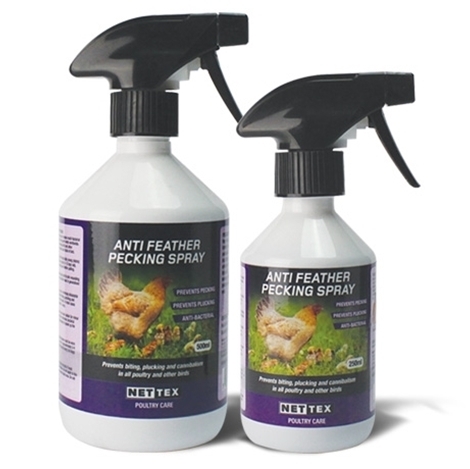 Unfortunately feather pecking can cause stress and may even lead to open wounds so the sooner you treat, the better. Nettex Anti Pecking Spray works 2 fold, firstly by preventing biting or plucking by way of a foul taste with a very strong odour. This foul tasting substance is so strong, most biting or plucking will cease after 1 or 2 days. Secondly, anti-bacterial agents have been added to help soothe and repair minor skin abrasions, and it will also disinfect the afflicted sites immediately. These agents also help to prevent any infection from spreading, thus speeding up the healing process.